Denmark – “We all have evil within us. Even small children are evil towards each other,” Danish-Norwegian artist Nina Maria Kleivan tells Haaretz as she explains why she chose to dress up her baby daughter as the most evil historical figures of the 20th century. While many will critique this artistic statement as offensive, it seems clear ffrom the article that the artists does not idolize any of history’s most wicked leaders. In order to raise consciousness, art often attempts to shock, to draw people out of their comfort zone and make them think. This particular artistic effort may be particularly distasteful, but I do not see myself as an art critic, leaving this craft to people far more able than I am. But I do find fault with her thesis. By dressing up a child as Hitler, she almost makes the appearance of such tyrants a matter beyond the free moral choice of the child. Are the Hitlers and the Stalins and the Pol Pots predestined, and more importantly, are their followers predestined to follow them? The artist may subconsciously be elaborating on the Christian notion of original sin, that man is inherently sinful and who knows how terrible he or she will turn out. They could even become murderous tyrants. However, considering how many societal and governmental failures happen before a tyrant rises to power, it seems anything but predestined. וַיַּרְא ה’ כִּי רַבָּה רָעַת הָאָדָם בָּאָרֶץ וְכָל־יֵצֶר מַחְשְׁבֹת לִבֹּו רַק רַע כָּל־הַיֹּֽום׃ And HASHEM saw that the wickedness of man was great in the earth, and that every imagination of the thoughts of his heart was only evil continually. 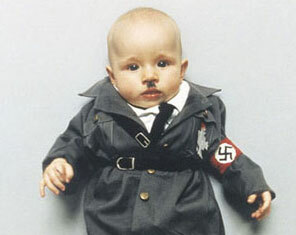 Ultimately, to dress babies as tyrants and to sensitize people to the idea that “We all have evil within us. Even small children are evil towards each other,” is to make light of the difference between the evil perpetrated by children who do not yet have a well developed a sense of right and wrong, on the one hand, and the choices of mature, capable adults, on the other hand. Children grow up and develop empathy, definitely when they are properly guided by their parents, their bad behavior cannot be called evil in the way that wicked adults are called evil. To equate the two forms of asocial behavior is ultimately to absolve the adult perpetrators of evil of some of the responsibility they bear for their actions. The Talmudic statement that a child is born with only his “yetzer hara’,” properly translated as “his drive for instant gratification,” rather than “evil inclination,” but that when he or she reaches puberty, is infused with a “yetzer hatov,” too, with a sense of delayed gratification a good inclination, which balances the yetzer hara’, very much confirms the emotional and moral development of the child I outligned above. Young, the child may act in asocial ways, because he is not yet equiped with a fully functioning faculty of moral analysis and empathy, however, pretty soon, the child develops those faculties and becomes well endowed to act rightly and justly, provided he does not choose to be evil. In short, the millions of Germans who supported Nazism were not psychopaths, nor were the vast majority of Nazis, however, they were all evil, because they chose evil. I am sure that there are more intelligent, more philosophically enticing displays of art in which babies may star. This entry was posted on Wednesday, March 17th, 2010 at 7:24 pm and is filed under English, news. You can follow any responses to this entry through the RSS 2.0 feed. You can leave a response, or trackback from your own site. Since you said “define”, I would define yeitzer hara as “that which causes evil forms”.